10.1-megapixel, large 1/1.7-inch CCD sensor for stunning images. 7.1x Wide-Angle Optical Zoom-NIKKOR ED Glass Lens. Versatile 28-200mm lens ranges wide to capture landscapes, zooms in to get close to the action. In the NIKKOR tradition of precision optics, the high-quality ED glass lens delivers superb color and razor-sharp results. Optical VR Image Stabilization by lens shift minimizes the effects of camera shake. Hybrid VR Image stabilization by lens shift and electronic VR. Motion Detection automatically detects moving subjects and adjusts shutter speed and ISO to compensate for camera shake and subject movement. High ISO up to 6400 at full resolution for optimum results when shooting in low light or photographing fast-moving subjects. Nikon’s Best Shot Selector (BSS) automatically takes up to ten shots while the shutter is pressed, then selects and saves the sharpest image. RAW file function compatible with Mac® and Windows®. Microsoft®, Windows® and Windows Vista™ are either registered trademarks or trademarks of Microsoft Corporation in the United States and/or other countries. Macintosh®, Mac OS® are trademarks of Apple Inc., registered in the U.S. and other countries. EXPEED C2 continues to expand the possibilities of photography with improved levels of image quality, fine detail and processing speed. 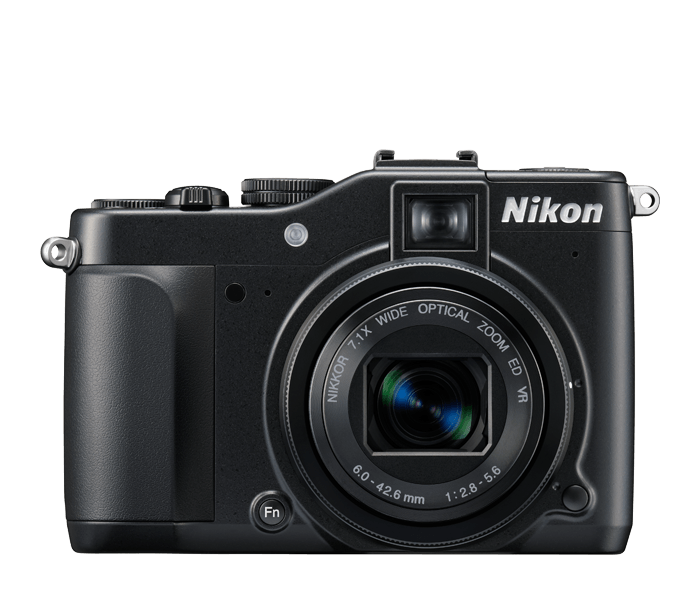 Custom-optimized for each COOLPIX model, Nikon’s renowned digital image processing engine ensures outstanding images. 3-inch Ultra-High Resolution (921,000-dot) Clear Color Display for still images and movies that come alive with rich detail and improved contrast. The large LCD's wide viewing angle and anti-glare coating make it easy to compose, view and share pictures. Large Optical viewfinder with diopter adjustment dial. Remote control operation with optional wireless ML-L3. Dial controls for key functions including ISO, white balance, bracketing, exposure compensation and more. PSAM (Program, Shutter, Aperture, Manual) exposure control, custom function control. ISO can be set as high as 6400 at full resolution; 12,800 in Low noise Night Mode (3-Megapixel). Tone Level Information provides photographers with 9 levels of grey scale information about the scene for fine exposure analysis according to user’s creative needs. In-camera editing functions include Exposure Compensation, COOLPIX Picture Control, Noise Reduction Filter, Quick Retouch, D-Lighting and Active D-Lighting. Electronic Virtual Horizon Display enables precise leveling of the camera in landscape or portrait orientation during LCD monitor shooting. COOLPIX Picture Control can be customized for Image Sharpening, Contrast, Saturation, Filter Effects, and Tone. HD (720p) Movie with Stereo, Mic Input Jack and HDMI Output. Records at 24 fps with Zoom, Autofocus and stereo sound. Mic Input Jack allows for optional microphone to be used during recording and HDMI output allows easy in-camera playback or convenient playback on HD-TV or computer. Ultra-fast start-up, autofocus and shooting. Subject Tracking tracks a moving subject to ensure sharp focus. Shoot Continuously up to 45 pictures at approx. 1.3 fps at full resolution. Smile Timer automatically releases the shutter when your subject smiles. In-Camera Red-Eye Fix™ automatically corrects most instances of red-eye as you shoot. You may never see red-eye again. Face-Priority AF. Nikon’s face-finding technology automatically detects up to 12 faces. Skin Softening smoothes skin tones at three different levels for optimal portraits; can be applied while shooting or during playback. Blink Warning alerts you if a subject has blinked. Built-in Flash plus i-TTL Flash function when used with optional Nikon Speedlight System. 18 Scene Modes, including Scene Auto Selector, for optimized shooting in a variety of settings and situations. Scene Auto Selector automatically recognizes the scene you're shooting and selects the most appropriate scene mode; offers six scene modes plus auto. Macro shooting as close as 0.8 inches. 350 still shots (approx.) with supplied EN-EL 14 Li-ion rechargeable battery. Unless otherwise stated, all figures are for a camera with a fully-charged Rechargeable Li-ion Battery EN-EL14 operated at an ambient temperature of 25°C (77°F). *Based on Camera and Imaging Products Association (CIPA) standards for measuring the life of camera batteries. Measured at (73(±4)°F); zoom adjusted with each shot, flash fired with every other shot, Image quality set to Normal, Image size set to [10M] 3648×2736. Battery life may vary depending on shooting interval and length of time menus and images are displayed.